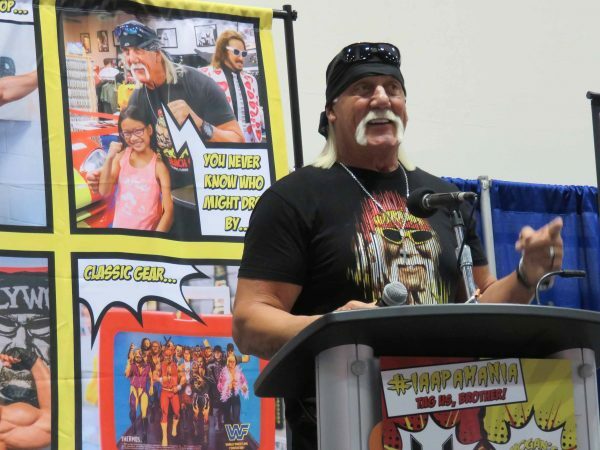 One of the bigger celebrity appearances at this year’s IAAPA Expo came from Professional Wrestler Hulk Hogan. Early this year, he opened Hogan’s Beach Shop in Orlando, near the intersection of International Drive and Sand Lake Blvd. His purpose for being at the expo was to find “tag team partners” in the industry who could help him turn his shop into more of an attraction. Wondering if he found one in Triotech? 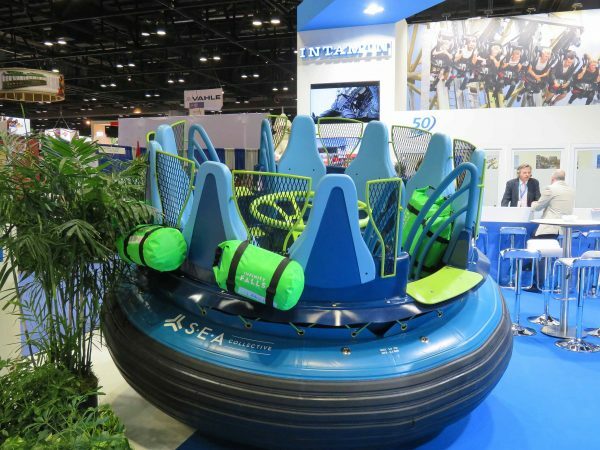 Intamin unveiled the ride vehicle for SeaWorld Orlando’s Infinity Falls, which will open in Summer of 2018. 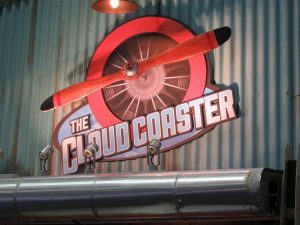 It will have the tallest drop on any rapids-style ride at 40′ tall. 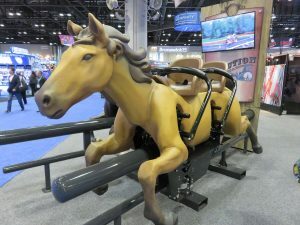 As we mentioned earlier, S&S is reviving the old Arrow Dynamics “Steeplechase” Design, and had several ride vehicles on display. 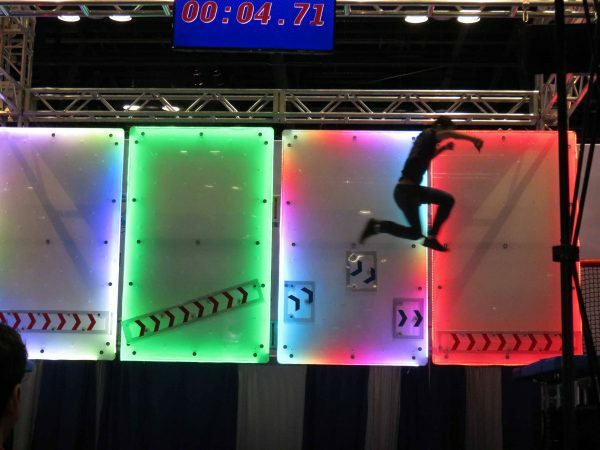 One of the more interesting booths I saw at the expo was this Ninja Warrior Course from Adventure Solutions. It’s completely modular and customizable, and during the four days of the expo, the gap pictured above had four separate ways to get across. I definitely am not agile enough to have tried this, but people were trying it constantly all week. 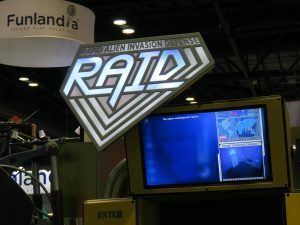 Funovation debuted their newest attraction concept, RAID, at the IAAPA Expo. 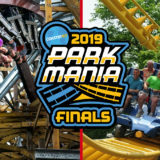 Different from their traditional Laser Maze/Beam Buster attraction, it involves new technology to avoid the laser beams while trying to score points by touching targets inside. Another attraction that I wasn’t quite agile enough for, but I did try this one twice, and was able to improve between attempts. 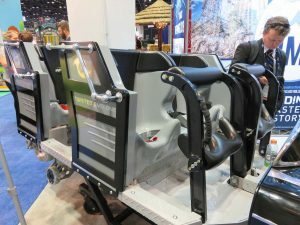 Big at the MACK Rides booth was the debut of the ride vehicle for Time Traveler, which will open at Silver Dollar City next year. Photos almost do these trains no justice, as the level of detail is outstanding. 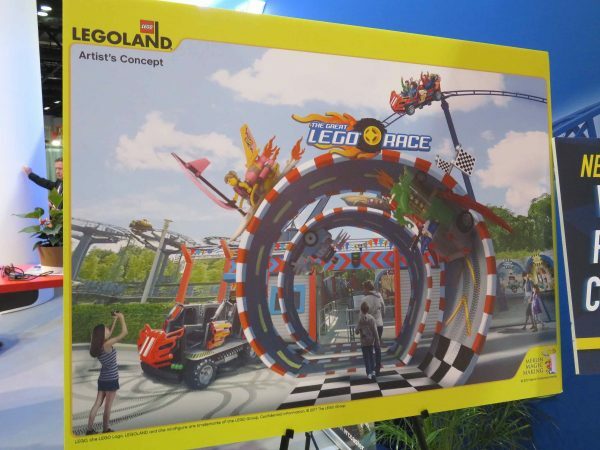 Also at the MACK rides booth, I got the chance to see the VR Ride Footage of The Great Lego Race, which will be added to Legoland’s existing MACK Wild Mouse Coasters across the chain. This was my first ever experience with VR anything, and I have to say that I was really impressed. 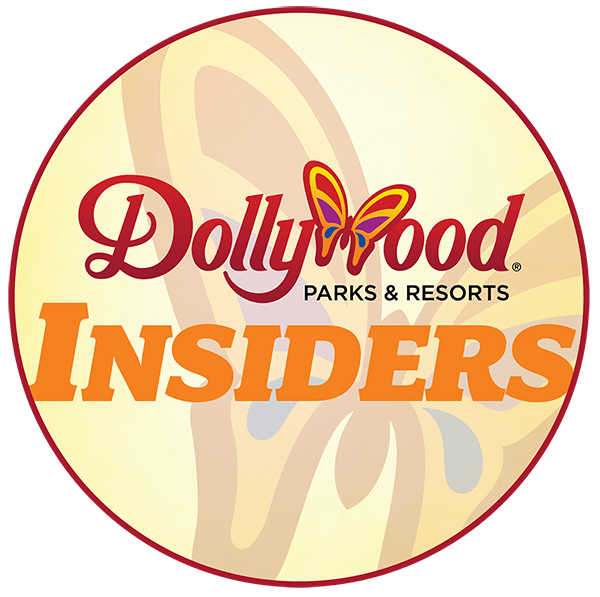 I watched the footage twice, once for the ride itself, and once to actually look around at the VR-created environment that was changing around me. 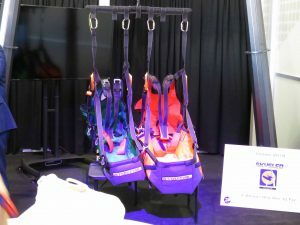 At Ride Entertainment, they were debuting several new concepts under the Ride Entertainment umbrella, including their “Skysled” harnesses for the SkyCoaster, which allows “flyers” to ride in a seated position rather than the traditional “Lay Down” harness of the SkyCoaster. 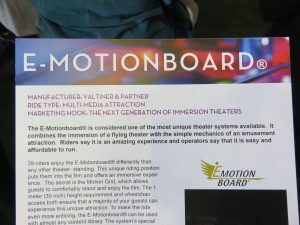 Ride Entertainment also unveiled their new E-Motionboard attraction, which can be best described as a Flying Theater that is experienced while standing instead of sitting. 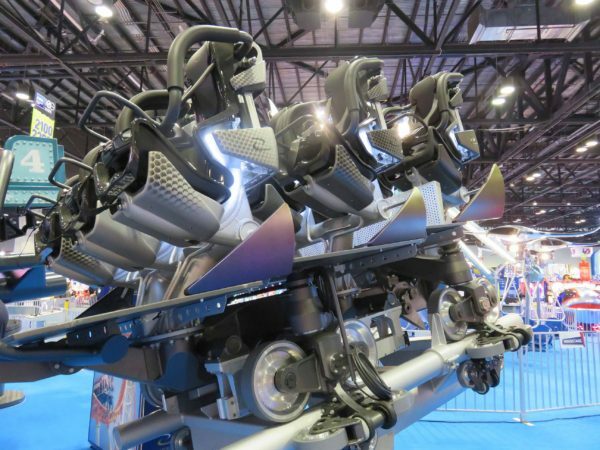 The first E-Motionboard will open at Six Flags in Dubai in 2019, and will utilize virtual reality based media while on Ride Entertainment’s Motionboard platform. 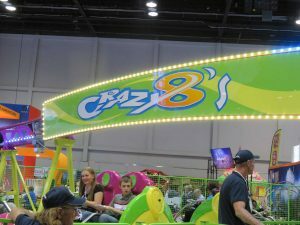 I rode my first SBF Visa spinning coaster earlier this year at Beech Bend, but was more than happy to take a “spin” on “Crazy 8’s” on the expo show floor. 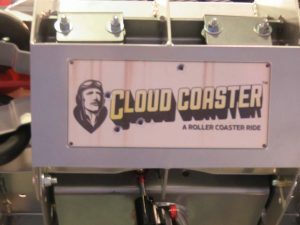 This coaster looks unimposing, but I was spinning a lot during the short duration. 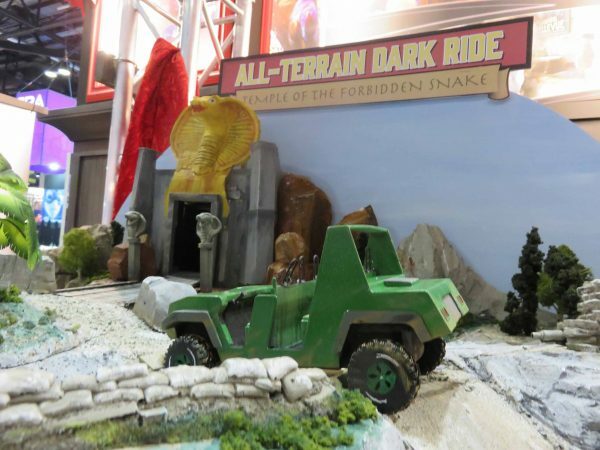 We already wrote about the car for Harley Quinn’s Crazy Train, being unveiled, and the Skywarp model was on display as well. 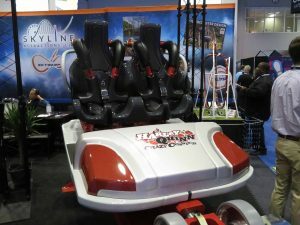 What we haven’t talked about yet are Skyline’s two newest concept products, Eclipse (Red) and Horizon (Yellow). 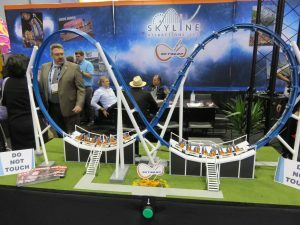 We’ll be posting a more in depth interview with Skyline Attractions later this week about these two new concepts. 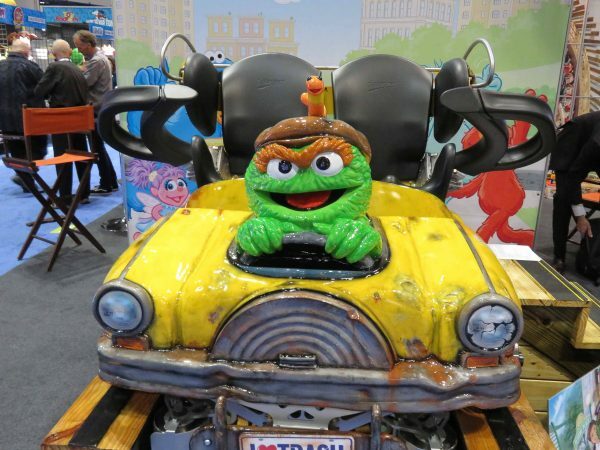 The Gravity Group unveiled the lead car for their junior wooden coaster, Oscar’s Wacky Taxi, opening at Sesame Place in 2018. 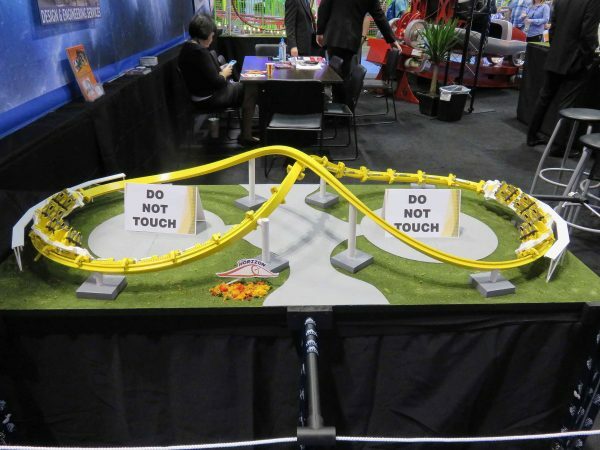 These are some of my favorite coaster trains I’ve ever seen. I love the attention to detail! 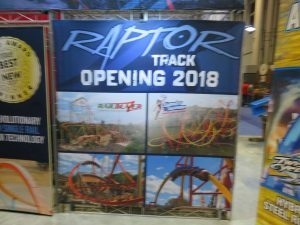 Next year is a big year for Rocky Mountain Construction, between Steel Vengeance, Twisted Timbers, Twisted Cyclone, and their two Raptor Projects, RailBlazer and Wonder Woman Golden Lasso. 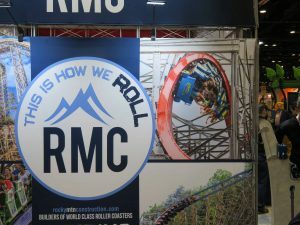 Also want to give a quick shoutout to my co-writer, Larry, whose photo of Storm Chaser was used by RMC by their booth! 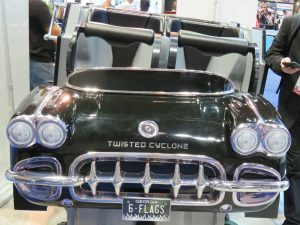 RMC had the lead car for Twisted Cyclone at Six Flags Over Georgia at their booth. 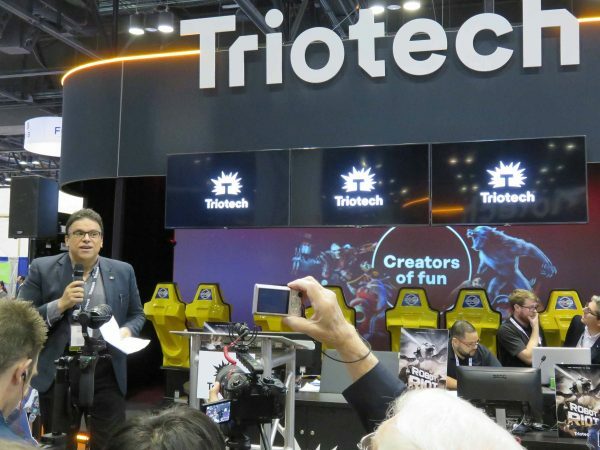 Canadian-based Triotech unveiled a new brand identity and logo at their booth, along with a multi-ride, multi-platform partnership with video game producer Ubisoft. 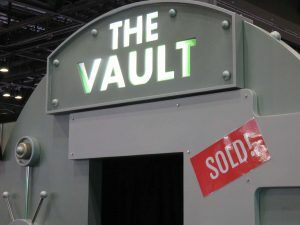 They also had two demonstration opportunities at their booth, with Interactive Motion Theaters featuring their newest creation, Robot Riot, and the final scene from Fear The Walking Dead: Survival in Las Vegas. 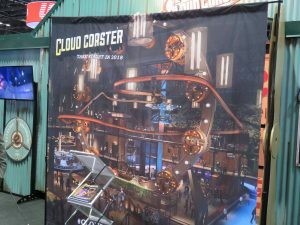 The folks over at Extreme Engineering announced their newest Cloud Coaster concept, which will be located at Megaparc in Quebec, Canada. 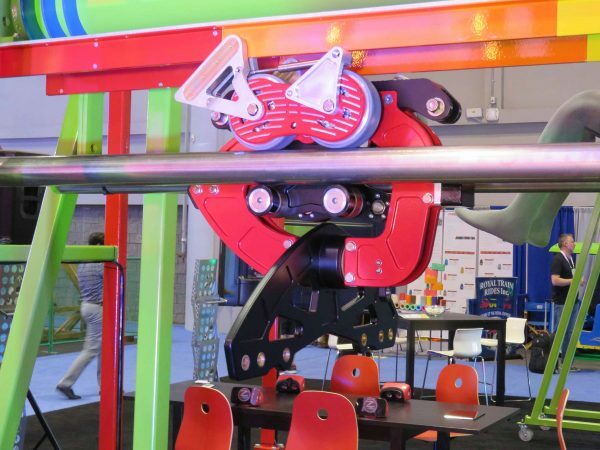 It will go through the center of a spoke-less Ferris Wheel, and will be the first attraction of its kind in North America. 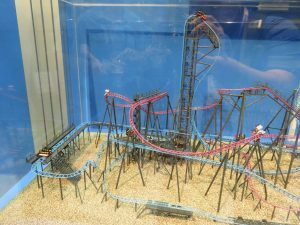 Gerstlauer had a model for their two coasters that will be going into the American Dream project in New Jersey. 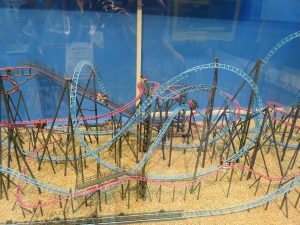 The Eurofighter design (blue coaster) will hold the distinction as the steepest roller coaster in the world when it opens. 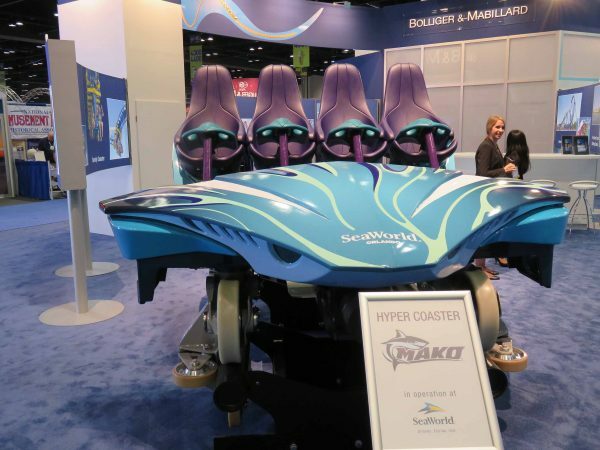 While there was nothing new announced by B&M this year, they did have a lead car from Mako at SeaWorld Orlando, which was the most recent B&M coaster to open in the United States. 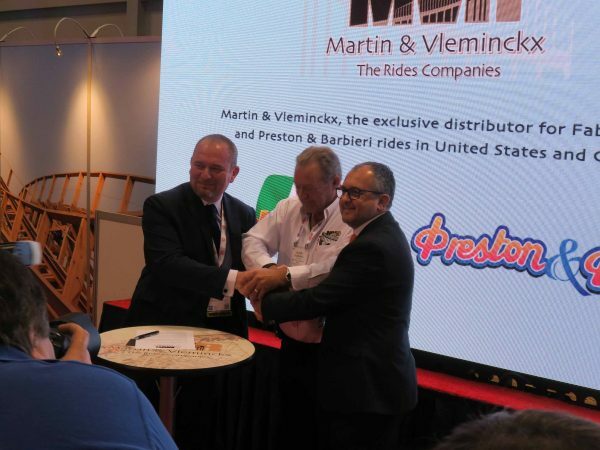 Martin & Vleminckx, primarily known for their erecting and manufacturing of rides, announced a partnership with the Fabbri Group and Preston & Barbieri Rides to become the exclusive distributor for their rides in the United States and Canada. Chance Rides debuted their Unicoaster 2.0 concept today. 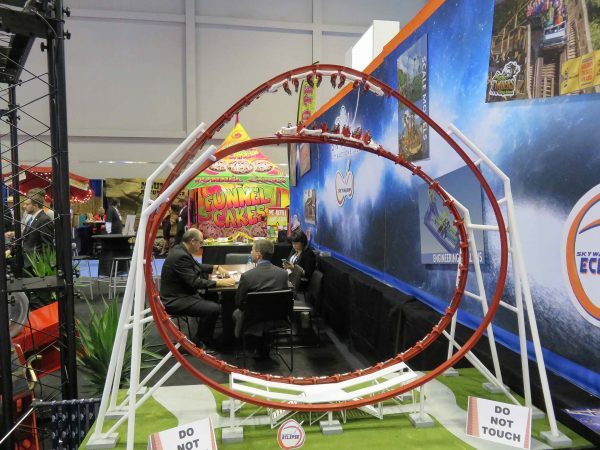 It takes the flat ride capabilities of the Unicoaster and puts them out on a customized roller coaster track. 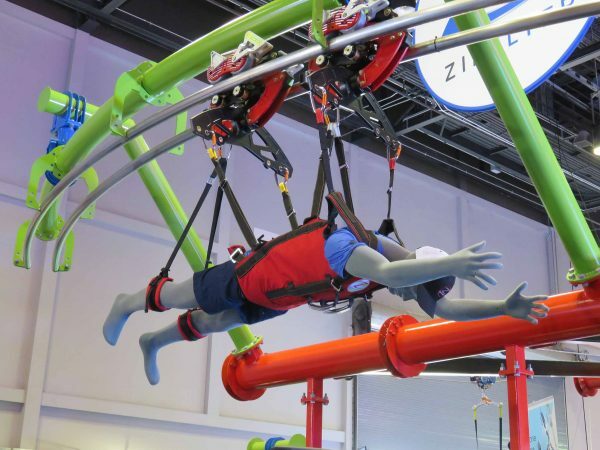 Zipflyer LLC announced their V2 ZipCoaster Harness, which will debut in 2018 in Hawaii. 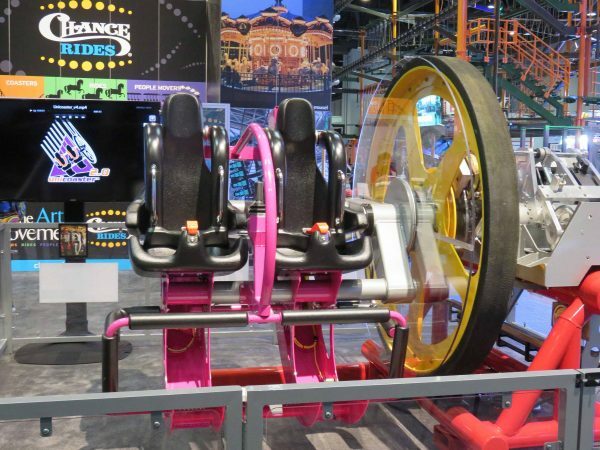 It looks like a roller coaster to me, and if classified as such, will be the first in the state of Hawaii. 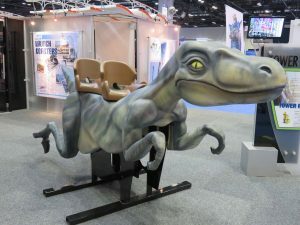 Alterface debuted two new concepts at IAAPA, Wander, a park-wide concept, and Erratic, a dark ride system. Both are non-linear attractions that have a bit of a “choose your own adventure” vibe to them. 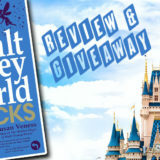 More details about these two attractions will come in a later post. Now at @Alterface, who are debuting Wander (a park-wide product) and Erratic, a first-of-its-kind dark ride, debuting at @WalibiBelgium. 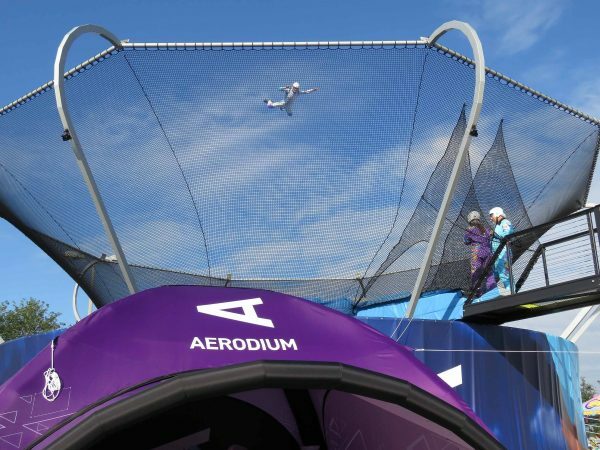 Aerodium had one of the most unique attractions at this year’s expo, in my opinion. It has taken the concept of indoor skydiving outdoors with this giant set up. This was one I wish I could have tried, but missed out on signing up. Maybe next year? 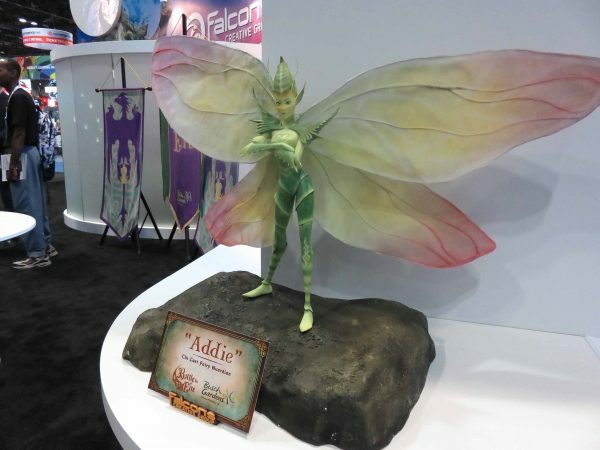 Over at Falcon’s Creative Group, I experienced some Augmented Reality Goggles in their booth. 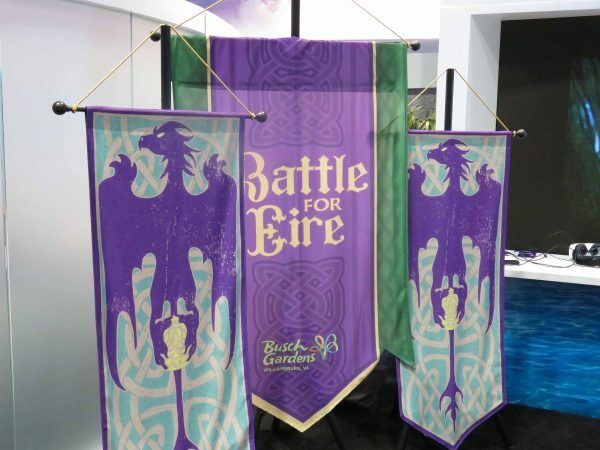 They are the company behind the media for Busch Gardens Williamsburg’s new-for-2018 VR Attraction, Battle for Eire. I can’t wait to experience this attraction in 2018. 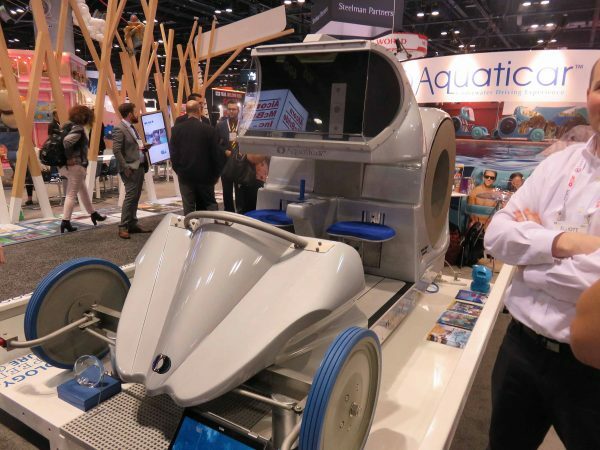 Another unique attraction was the tracked Aquaticar from SubSea Systems. It’s bubble-powered! 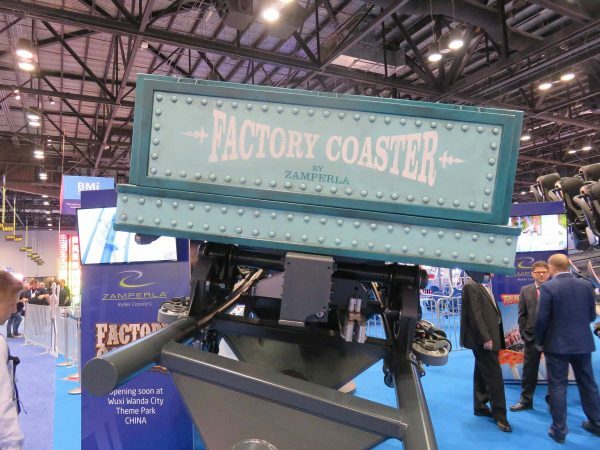 At Zamperla’s booth, they were displaying their Factory Coaster Car (debuting in China soon) and their Thunderbolt (Pictured) and Junior Coaster Cars. 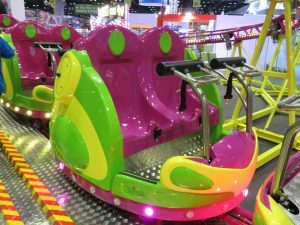 Zamperla also had an impressive collection of flat rides in their booth. 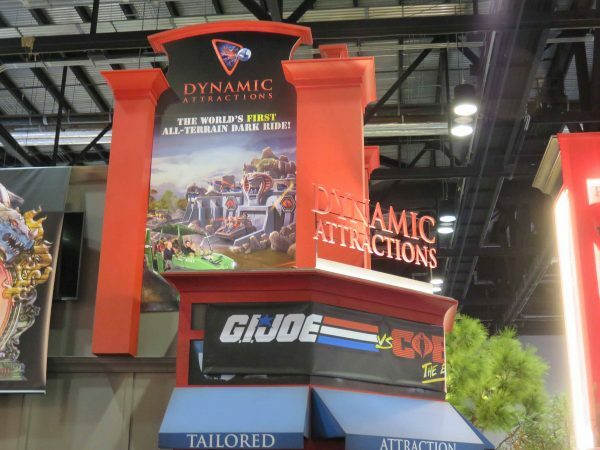 Dynamic Attractions won a Brass Ring Award for their new product, the All-Terrain Dark Ride. We’ll have a more in-depth conversation with Dynamic Attractions posted later this week. 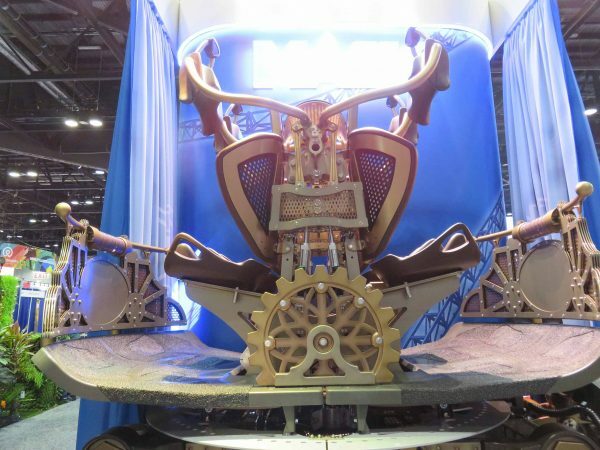 Another Brass Ring Winner, Maurer rides’ Spike Racing Coaster car was on display. 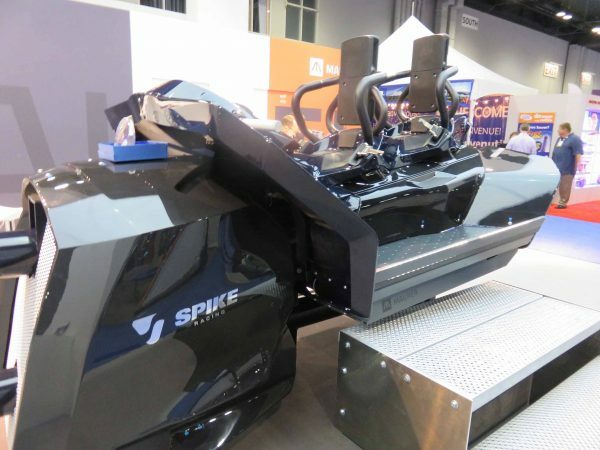 Check out our story on Spike from last year’s IAAPA Expo! 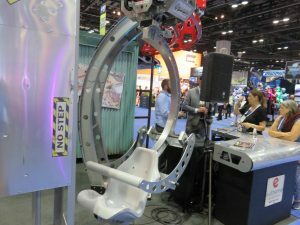 There will be more coming to Coaster101 from IAAPA in the coming days. Stay tuned!